OLYMPIA — BNSF Railway doesn’t want civilians to know how often it transports large shipments of Bakken crude oil through Snohomish County, but a mathematician from Everett can give you a pretty good estimate. Dean Smith, 71, a retired researcher for a federal agency, isn’t on the “need-to-know” list, but he’s got a darn good idea of the frequency and routes of oil trains. He organized the Snohomish County Train Watch, and he and 29 volunteers monitored train traffic in Edmonds, Everett and Marysville for a week in April. 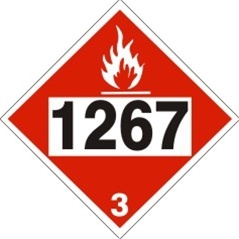 Crude-oil tank cars can be identified by their red, diamond-shaped hazardous-material placards that bear the number 1267. They tried to keep track around the clock but missed a few shifts. Even so, they counted 16 shipments of oil and 20 of coal, Smith said. They also tallied another 96 trains, including those of Amtrak, the Sounder commuter run between Seattle and Everett and other freight during the period. Smith presented the results at a meeting Monday and posted them online. He’ll share them with U.S. Rep. Rick Larsen, D-Wash., in a meeting Friday. “What motivated me was noticing the oil trains. I saw them and thought, ‘What’s going on?’” he said. Three railroads in the state insist what’s going on should be released only to emergency responders and not the general public. State officials disagree and consider the reports to be public records but aren’t releasing them yet. BNSF and the two other railroads have complied with a federal order and given the state government an idea of the volume, frequency and routes along which they move the highly flammable North Dakota crude in Washington. But the BNSF, Tacoma Rail and the Portland and Western Railroad have until the end of next of week to obtain a court order preventing disclosure. If they don’t, the state will hand over records to those requesting them, including The Herald. “We continue and will continue to work with the railroads to address their concerns and still meet the requirements of the state’s Public Records Act,” said Karina Shagren, spokeswoman for the state Emergency Management Division. The shipment of crude oil by rail has greatly increased in recent years, and notable serious accidents in the U.S. and Canada, including a deadly crash in Quebec, have drawn attention to tank-car safety. Such incidents prompted the federal rule requiring railroads to disclose information about shipments. The state Department of Ecology estimates Bakken crude shipments by rail in Washington rose from zero barrels in 2011 to nearly 17 million barrels in 2013. Gov. Jay Inslee on Thursday said he wants state agencies to move more swiftly to assess the risks to public safety posed by the increasing number of oil trains traveling through Washington. Inslee directed the Department of Ecology to analyze the risk of accidents along rail lines, compare the danger of Bakken crude to other types of crude and identify any gaps in the state’s ability to prevent and respond to oil spills from rail tank cars. These issues are already getting a look as part of a $300,000 study of oil transportation approved by state lawmakers earlier this year. Work on that report will begin this month, and findings due to Inslee and lawmakers in December. Inslee’s directive seeks some recommendations by Oct. 1, when he will be in the midst of drafting his next state budget proposal. The U.S. Department of Transportation in May ordered railroads carrying more than 1 million gallons of Bakken crude in a single train – about 35 tank cars – to tell state authorities how many such shipments they expect to move through each county each week and on what routes. They were not required to provide the days and times of the shipments. BNSF Railway, the dominant carrier north of Seattle and to points east, averages one-and-a-half to two trains loaded with Bakken going to “facilities in the Pacific Northwest in a 24-hour period,” according to company spokesman Gus Melonas. He wouldn’t reveal how much oil those trains carry to refineries in Anacortes and Ferndale or which routes they travel. “BNSF believes this type of shipment data is considered security-sensitive and confidential, intended for people who have ‘a need to know’ for such information, such as first responders and emergency planners,” Melonas told The Herald in an email. Lyn Gross, director of the Emergency Services Coordinating Agency in Snohomish County, is one of those with a need to know and has received the information. She declined to share details but said what she read didn’t incite her to consider revising the group’s handling of hazardous-material incidents. Her agency handles emergency management for 10 cities in south Snohomish County. Regular citizen Smith wants to repeat the train-watching exercise every two to three months to keep city, county and state leaders informed. He said he hopes that will spur a critical examination of the need for changes in emergency response plans. Snohomish County residents are not the only ones tracking trains. The Vancouver Action Network is keeping watch and spreading data and photos through online sites and social media. Oil train activists are planning a statewide summit in Olympia in August. Train monitoring is on the rise because rail transport of all types of crude oil, including Bakken, is multiplying in Washington. Until the federal order took effect last week, railroads did not need to tell anyone about the amount of Bakken they were taking to refineries in Whatcom and Pierce counties. Tacoma Rail estimated that each week it runs three unit trains of 90 to 120 railroad tank cars apiece, according to a copy of the report obtained by The Herald. Those trains are traveling on tracks in and around the Tacoma Rail train yard in Pierce County. Union Pacific, which doesn’t have a large presence in Western Washington, told the state it has nothing to report. That doesn’t mean the Union Pacific isn’t shipping Bakken crude to locations in Washington — only that it isn’t handling quantities large enough to be subject to disclosure, Shagren said. KXRO: If this grain were oil…. The third train-car derailment in as many weeks has Pacific Northwest tribes that oppose oil-rail transport on edge.